Hungary is a relatively 'closed' country, neither outward nor inward migration is really significant. Hungary is among the less important sending countries of the EU's new member states and, as host country, attracts much less migrants in relative terms than the old EU members. Compared to the communist era the mobility in both directions is more significant, but the EU accession has not changed the characteristics of migration in either direction. Most of the immigrants arrive from neighbouring countries and they are typically ethnic Hungarians. This explains the relative importance of naturalisations appearing in highly diverging numbers of foreign born persons and foreign citizens, respectively, in Hungary. 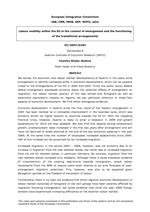 Foreign employment is highly concentrated in the Budapest agglomeration and to a smaller extent in Central Transdanubia, both regions figuring as engines of growth in Hungary. The breakdown of foreign employees by branches significantly differs from that of the total employees. Foreigners are over-represented in construction and industry while under-represented in the services sectors. This latter, however may accommodate a substantial part of illegal employment.